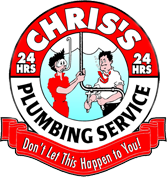 Chris's Plumbing offers a full line of services for residential, commercial, and industrial customers. Serving the Tampa Bay Area since 1986, we can fix your septic tank, provide your event with portable toilets, fix your home or business plumbing, or provide you with top of the line plumbing products. We're there to meet your needs 24 hours a day.